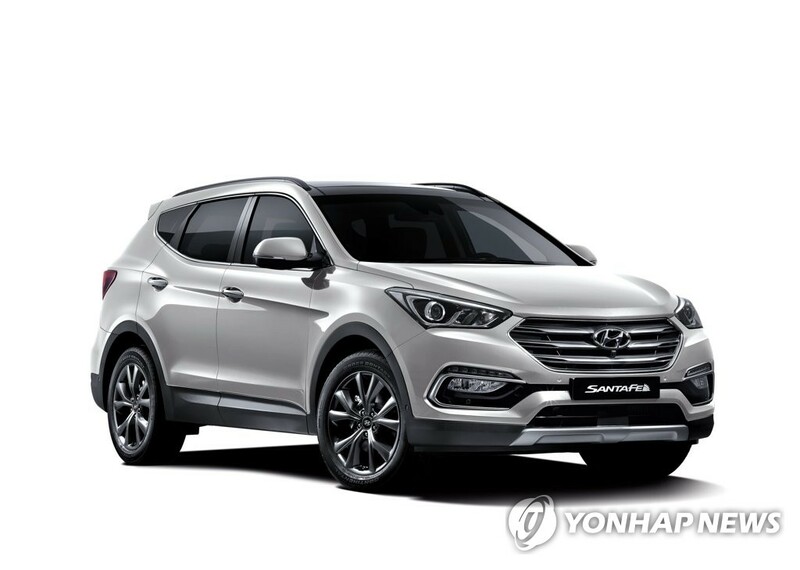 SEOUL, Dec. 4 (Yonhap) — Hyundai Motor’s crossover sport utility vehicle Santa Fe is near certain to join the best-seller club, joining the company’s Grandeur sedan, by selling more than 100,000 units this year, industry data showed Tuesday. Santa Fe, released with a full change in March, was relegated to second best-selling car in November, ousted by Grandeur. The aggregate sales total for the SUV for January-November was 98,559 units, falling behind the full-size sedan. Nevertheless, Santa Fe needs only 1,500 sales in December to join the 100,000 sales club, a figure that industry officials say will be easy to reach. Grandeur has already reached the status by selling 102,682 units this year as of November. It was the top seller in November among local brands, with 10,191 units. The performance is most likely to make the full-sized sedan the best-selling car at home for the second year in a row. Grandeur’s sales, whose January-November tally is 16.5 percent lower than the same period last year, were saved by the popularity of its hybrid version. The Grandeur hybrid sold 22,161 units in the measured months, up 33.5 percent from the same period last year.